Late Sunday night after running the Nike Human Race, standing on Soldier Field to try and catch a glimpse of Fallout Boy (actually I was more interested in seeing Ashlee Simpson to be honest), and eating the best garlic cheese bread ever – yes, ever, I collapsed in my living room chair with the dog and turned on the Discovery Channel. Yep. Party on. I live an exciting live here in Chicago in these final days of summer. Second a squid is not an octopus. I have nothing more to share here. Just know that it isn’t an octopus. 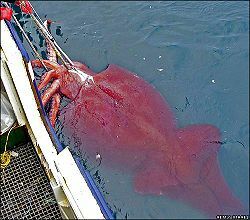 Thirdly, ‘Sid’ is one big squid. He can grow to over forty-five feet and weigh over a thousand pounds. The only one that has ever been caught alive was off of Antarctica somewhere where it was subsequently ‘killed for science’ and turned into a squid popsicle and brought back to New Zealand so that they could make a show about him ‘thawing’ for the three viewers (and a dog) who had nothing better to do in the middle of the night then watch the Discovery channel. *Note, the whole time I was watching this I was trying to figure out how we, the human race, benefited from spending a gazillion dollars on a squid tank but then again I sell social software so what would I know. One takeaway that I did have was the fact that while the giant squid has tentacles full of suckers, the colossal squid has hooks that spin 360 degrees. Suckers or hooks we are pretty much SOL either way; that is if you happen to find yourself snorkeling in the Arctic Ocean. Apparently the sperm whale is its only predator whatever they are – I certainly haven’t come across one at Sea World. So here is my question to you. After about forty-five minutes I fell asleep – right before we learned if ‘Sid’ had a hectocotylus. (Basically before we found out of ‘Sid’ was a boy or not.) My last recollection was of the crazy scientist jumping up and down shouting ‘a hectocotylus, a hectocotylus, OMG! OMG!’ but then it cut to a commercial break alluding to the fact that maybe it wasn’t a hectocotylus. Total cliffhanger. It’s been killing me all weekend. Anyone want to own up to catching this one? Boy or girl, I’m dyin’ to know.